The Euro-Domo lean-to from Euro-Serre is an ideal greenhouse solution for big or medium sized gardening areas and patios next to a suitable wall. 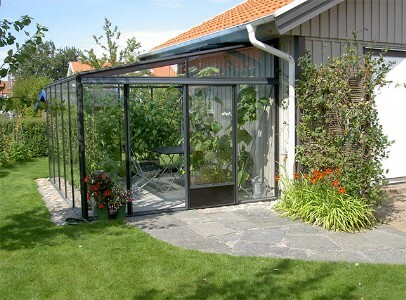 This lean-to greenhouse offers lots of space and all the advantages of a quality greenhouse. It has a rust resistant aluminium frames and can be glazed with 4mm toughened glass or 8mm polycarbonate sheets to ensure a durable stable product for many years to come. Standard features: roof vents and sliding door in gable end. The Euro-Domo is available in two width: 2.33m (7'8'') and 3.08m (10'1''). Ridge height with plinth 2.33m (7'8''), respectively 2.41m (7'11''). Option: extended eaves height up to 2.01m (6'7'') - extra charge applies. Standard roof pitch is 11°. Option: 25° - extra charge applies. All Prices for Euro-Domo include VAT, delivery and set-up! All Prices in EURO. Prices include VAT, delivery to your door and assembly*) on existing base**) or with plinth***) by our staff. Countrywide construction service. *)charge for expenses at cost. Free within 100 kilometres. **)recommended materials: blocks, concrete. On request proper measurements available, site must be clear. ***) trench for foundation frame required, measurements available. For self assembly flat packed ex Peppermint Farm deduct 15% of basic price. No of roof vents with hand opener: see in table. additional roof or side window with hand opener € 60 (coloured frames +60%), automatic window opener € 50, side window expander € 55. Prices for standard coloured frames = green, red, white, blue, grey and black see table; non standard colours: extra charge + 10%. Mixed glazing solutions are possible, e.g. roof glazed with polycarbonate, sides glazed with toughened glass.